Swarovski Waterschool’s success demonstrates how the power of education can transform lives and tackle pressing environmental issues. To date, Swarovski Waterschool has taught over 500,000 children in areas throughout the globe. Over 40 schools have educated local communities, reaching more than 10,000 people. 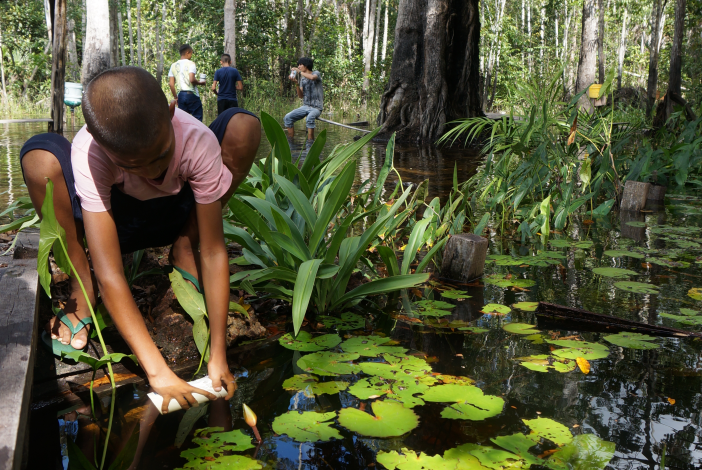 62 schools are continuously collecting plastic on the Amazon River banks. Over 3,500 trees were planted in areas affected by climate change. Water tanks were built in 10 local schools, bringing safe water to 6,000 children and their communities. 16 sanitary facilities were built by empowering and teaching women new masonry skills. The first Swarovski Waterschool opens at the National Park Hohe Tauren within the basin of the Danube. An educational program is formulated to sensitize children and young adults to the importance and scarcity of water. The Diversity Center in Salzburg runs a survey with 217 children from 35 schools in 24 communities, demonstrating that children participating in the Waterschool project change their behavior and have higher competences concerning water-related topics. The first project outside of Austria, the Swarovski Waterschool India opens around the Keoladeo National park in Rhajasthan in the Ganges basin. Children of Swarovski employees are now able to take part in a five-day water summer camp at the “House of Water” in the National Park Hohe Tauern, benefiting from a financial subsidy by the company. The Banyara Gravity Flow Scheme commissioned by Swarovski supplies 20 schools with rainwater tanks and sanitary facilities, significantly reducing student absenteeism linked to water-borne diseases. The program is realized in cooperation with the Earth Child Institute (ECI) in the state of Parà in the North of Brazil focusing on water and environmental education through school- and community-based participatory learning. Three pilot projects launch with various organizations to highlight local water sources. In a joint effort among all implementing NGO partners and Swarovski, the global edition of “Drops of Knowledge for Rivers of Change” teaching and learning material is launched on the SWS website. "The project opened our eyes to nature and ecology. Starting at seed level is nature's way, and that's what Waterschool helps us do."